"Steinbock" redirects here. For the African antelope sometimes known as "steinbock", see Steenbok. For other uses, see Steinbock (disambiguation). ↑ Aulagnier, S., Kranz, A., Lovari, S., Jdeidi, T., Masseti, M., Nader, I., de Smet, K. & Cuzin, F. (2008). 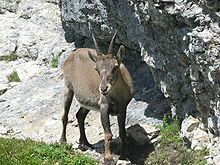 Capra ibex. 2008 IUCN Red List of Threatened Species. IUCN 2008. Retrieved on 5 April 2009. Database entry includes a brief justification of why this species is of least concern.